Natural high protein meal replacement shake. OR if you run out of fresh greens, add 2 scoops of Amazing Green Powder for an extra healthy green boost. Blending this way allows the dry ingredients to be blended for longest, it means the greens will fit in your blender and your fruit gets less blending so it doesn’t become too hot. Add more water if required to thin it out. Substitute any of the ingredients for whatever you already have. If your smoothie is too warm, you can cool it down in the fridge or freeze some of your ingredients before blending. You can also replace half of the liquids with ice. Add the ice at the end. It is better to add frozen ingredients at the end to cool the smoothie down. How much should I drink to replace a meal? 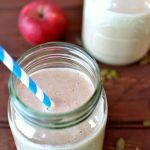 – This smoothie serves 1 so if you have higher calorie requirements you might need to make more.